Zimbabwe | Something should go here, maybe later. There can be fewer good signs of progress in Zimbabwe than the BBC being let back in. Even better, they’re able to film the supermarkets that are now filled with food, after the US dollar was adopted. There’s still massive problems (the food is expensive) but things are looking positive. If you’d told me that things would be this good now (with Mugabe still in command) a few months back, I’d never have believed you! Maybe he has realised that destroying his country isn’t the best strategy? We’ll see I guess. Robert Mugabe, Head Thug of Zimbabwe, was getting a little uncomfortable with too many foreigners coming in to help with the cholera epedemic his actions started. So, he declared that it was over. Mr Mugabe spoke as a district in neighbouring South Africa was declared a disaster area because of the spreading disease, which has killed hundreds in Zimbabwe. He went on to denounce former colonial power Britain, as well as French President Nicolas Sarkozy and US President George W Bush, who both called earlier this week for the 84-year-old to resign. But Save the Children in Harare said these figures were an underestimate and the epidemic was almost certainly worsening. His country is crumbling, but he just doesn’t care about anything but his own power. Just watched a report on TV3 news on the Zimbabwe election. There are very short queues, and police at the polling boths “helping” people cast their votes. They had a guy holding up a t-shirt from an opposition member who died, covered soaked in blood with several holes. They even showed a 4 year old who had been beaten when his mother was kidnapped – she was still missing. They finished by calling Mugabe “deluded and dangerous”. From what the wife is hearing on Rhema, the situation has turned drasticly. Before the last vote, people discussed politics openly, now no one dare suggest they would vote for anyone other than Mugabe. “Meeting” are held late into the night with attendance compulsory. It’s very quickly moving towards a North Korea model, with the last vestiges of open democracy being stripped away. As we all know by now, Morgan Tsvangirai has pulled out of the Zimbabwe Presidential run-off. A very hard decision indeed. One is glad not to be those shoes. I was reading the coverage just now, and it made me realise how many people would arrive at the polls and have to put their life on the line to vote for the MDC, either immediately or by starvation. With that sort of pressure, it’s possible that Mugabe might actually get more votes. Fact is, the guy hasn’t been elected for over ten years or more. Why risk giving him the satisfaction? That’s my thinking tonight anyway. When I first heard them talking about pulling out I thought it was a terrible idea. Fact is, there is no way forward for that country that does not involve significant hardship and large numbers of people dying. Maybe the local countries’ pressure will make some difference? We can only hope. Yes, that’s the original title – can’t really improve on it. This is what happens when your main campaign tatics is to give thugs a blank cheque. The three men who pulled up outside her house were looking for her husband, who was in Harare, and left before coming back an hour later to kill her. Her body was so badly burnt that she was not able to be properly placed in a coffin as her arm was burnt rigid. Last Friday’s killing was carried out as violence worsens in the run-off presidential elections in two weeks time. It also follows the chilling brutality methods of Sirrra Leone rebel leader Foday Sankoh, whose trade-mark was to chop off hands and feet. According to The Times, Mrs Chipiro, 45, a former pre-school teacher, was the second wife of a junior official of the Movement for Democratic Change (MDC) burnt alive by Zanu (PF) militiamen. He said that instead of 21 days, Zec now had 90 days from the day the results were announced on 2 May to hold the vote. This means the election should now take place on, or before, 31 July. The MDC has always demanded that the poll take place within the originally mandated time frame. But Zec Chairman George Chiweshe told the BBC News website that the previous deadline of 23 May left “insufficient time” for preparations. 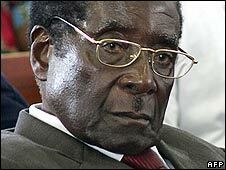 Mugabe is not going to give up power. He’s already delayed the second round by weeks, (voting remember was on 29 March) and by the time of this new round, he’ll have bought himself an extra 4 months. Delays on top of that will dissipate the tension in the populace, there’ll be “delays” (I’d also bet that they won’t be posting the results at many polling stations, in breach of the law that helped the opposition last time) in counting the vote and before you know it, Mugabe will have the best part of another year under his belt. My guess is that he’ll dismiss the new parliament and schedule new elections under some sort of “emergency” provision and/or arrest Tsvangirai. The new parliamentary elections will be declared invalid, and Mugabe will just “forget” to schedule new ones or keep dismissing those elected and just rule the country himself until he dies. Suffice to say, this guy isn’t going to give up power, not easily, not at all. Because he does not hold a Zanu-PF membership card, it was assumed he was an MDC supporter. And the worst part was that he was given a “certificate” to show he had received his beating. He was told to produce it whenever someone else wanted to beat him as proof that it had already been done. The paper even had a date stamp and the signature of the leader of the group. BBC has the results of the Zimbabwe Elections – officially. The long-awaited results of Zimbabwe’s presidential poll have been announced, with the opposition’s Morgan Tsvangirai winning 47.9%, forcing a second round. 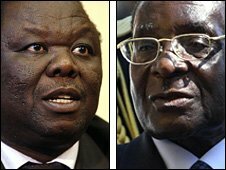 Election officials say Mr Tsvangirai beat President Robert Mugabe’s 43.2%, but neither candidate passed the 50% threshold for an outright win. Now the world gets to witness Mugabe at his most desperate – expect widespread intimidation. Well, it looks like the Zimbabwe recount survived attempts to monkey it. Ms Frazer’s comments came a day after the electoral commission announced Mr Mugabe’s Zanu-PF had failed to regain its parliamentary majority after a partial recount of votes. The results were unchanged in 18 of 23 seats where recounts had taken place, it said. Not so good is that Zimbabwe is falling off the radar. This story wasn’t even top African story on the BBC and I couldn’t see anything about Zimbabwe on the front page. Let’s hope the good news continues though. It’s time this tin pot dictator was shown the door with a swift kick up the arse. Zimbabwe – Why so peaceful? If you’re like me, you’re wondering a few things about Zimbabwe. Like, why didn’t they use those results posted at election places in the last elections? If they weren’t there before, how on earth did they get there? The answer is buried in this article about Mbeki’s (SA President) largely useless “quiet diplomacy”. For a time, the quiet approach produced results. South Africa brokered a new election law which could yet prove decisive. For the first time, electoral officials have had to post the number of votes cast at individual polling stations, making it much harder to manipulate the figures centrally. The MDC have been smart in exploiting this new openness – they say they have photographs of every result as it was posted on the day. This is probably not true, but they have a lot, and Zanu-PF – and the Zimbabwe Electoral Commission – do not know which ones they have, making any attempted rigging of the vote centrally a tricky business. Another part of the puzzle of the overall picture is Simba Makoni, the third candidate for president. I’ve lost my source, but apparently this guy was so involved in the intelligence side of Mugabe’s outfit that Mugabe doesn’t know who he can trust to rig his elections. Between those two things, this looks like the best change to get rid of the guy for a long time. At this stage, it looks like his strategy is to just deny everything and stay put.